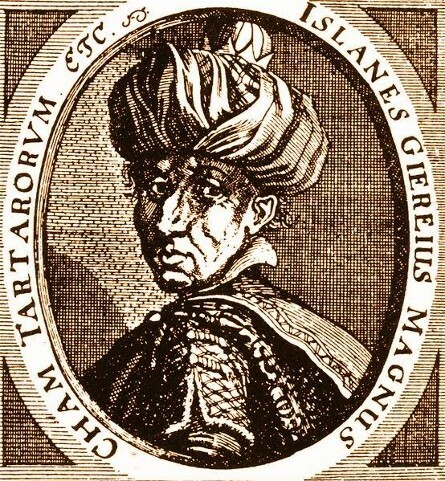 Islam-Girei III (Islam Giray), 1604–June 1654. Khan of the Crimean Tatars in 1644–54 and an untrustworthy ally of Hetman Bohdan Khmelnytsky in the Cossack-Polish War of 1648–57. While in Ukraine, his forces pillaged towns and villages, and carried off the inhabitants as slaves. Islam-Girei III deserted Khmelnytsky thrice—at the Battle of Zboriv (1649) and the Battle of Berestechko (1651) and the siege of Zhvanets (1653)—each time entering into a separate peace agreement with the Polish king Jan II Casimir Vasa. He played both sides in the conflict to his own advantage. Consequently, Khmelnytsky turned to Muscovy for aid and signed the Pereiaslav Treaty of 1654 with the tsar. According to a Ukrainian legend, a Ukrainian woman slave avenged the destruction wrought in her country by the Tatars by poisoning Islam-Girei III.